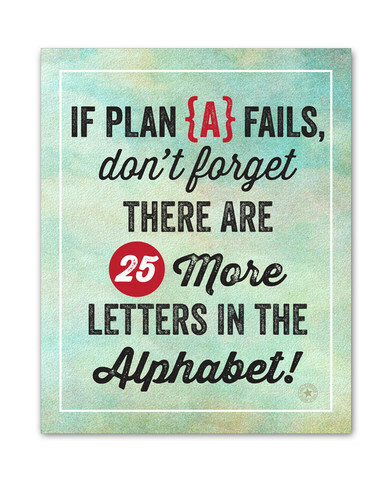 What Happens When Plan A Fails? I’m a planner. I need to think things through, research if necessary, and plan every detail out. For me, it’s a way to make sure my time isn’t wasted, my days are productive, and I get the most out of every situation. It’s a way to keep me sane. I struggle when things don’t work out as planned. It throws me off, and I sometimes find myself easily overwhelmed. Have you ever done this? Unfortunately, when this happens I oftentimes overreact and let my emotions take control. Now, it’s one thing for emotions to take control when your alarm doesn’t go off the day of a most important meeting, causing you to rush to get ready, get caught in traffic, and arrive at the airport just in time to see your plane take off knowing you only had an hour between that flight landing and the start of your meeting. It’s another thing for emotions to take control when you bought a headband specifically for your daughter to wear for her first school pictures, and when that day finally comes, the headband is nowhere to be found, so you’re left sticking a simple clip in her hair to keep it out of her face (and her pictures were incredibly precious, by the way). I mean, really. It’s a headband. It’s a picture. No need to treat it like it’s the end of the world, but I won’t lie. That did happen to me, and you would have thought somebody was going to die if she didn’t wear that headband (which we still cannot find). Whether it’s something insignificant, like a headband, or something much more, the first thing you need to realize is your emotions will be affected. The next thing you need to realize is . . . it’s okay to feel whatever feelings arise when something doesn’t go as planned. It’s in what you do with those emotions that’s most important. Pastor Doug Walker of Fellowship of the Parks in Keller, TX, recently went through a series entitled Plan B. It couldn’t have come at a more perfect time for me. I had already been going through an extremely tough time with a major “Plan A” taking a turn for the absolute worse. As a planner, major things in my life are never taken lightly. I don’t walk into anything without giving it great thought or without feeling like I’m on track. Regardless of the thought one puts into a particular plan, life doesn’t always comply. Even in the most thought out and well-intended aspects of life, sometimes going to Plan B (or C or D . . .) is inevitable. It sometimes takes our emotions longer to catch up to the theology of what we already know, so it’s important to . . .
Not deny our natural responses when something drastic happens that causes us to have to change our plans. God can bless our Plan B (or C or D . . .) if we allow him to. God will restore us to an even greater honor after we’ve gone through hardships whether it’s at the hand of others or decisions we’ve made ourselves (Psalm 71:20-21). So I’m writing this with a smile rather than tears knowing an incredibly significant and very carefully thought out Plan A of mine is in the midst of changing to a Plan B. I’m not smiling because my plan failed, but I’m smiling because no matter what others assume they know, God truly knows. God knows my heart, and I’m smiling because he will restore me to an even greater honor, and he will bless my Plan B so abundantly as I continue to do what he has called me to do and as I do it for his glory and honor and praise. He is my audience of one, and he can and will bless my Plan B. And he will surely do the same for yours! If you would like to listen to this series, please click FOTP Plan B. You can plan and dream about what your life will look like, but what happens when it doesn’t work out the way you planned it? Because of our decisions and the decisions of others, we may find ourselves somewhere we never thought we would ever be: a career we aren’t passionate about, divorced, struggling with children, unplanned pregnancy, and the list could go on.